Last week Josh Duggar did what you and I will most likely never have to do: he faced the consequences of his sin in front of the entire world. In the background was his wife Anna, the life she thought she knew crumbling before her eyes. Josh knew what he did in secret. Anna, however, was unaware she was strapped to a ticking time bomb until it actually went off. My heart aches for Anna. As a Christian stay-at-home mom with four little ones I feel like I know her. I know how she probably shops and meal plans and juggles church and family – and how she looks to her husband for strength. The world was not shocked by the news. It was delighted by it. The world expects Christians to be hypocrites and waits for every opportunity to expose them. But Christian wives all over the nation have been shaken. How could this happen to someone like Anna? She’s not a Kardashian. She’s a domestic, homeschooled, 26-year-old, mother of four. She dresses modestly and shops at thrift stores. She values family and selflessly serves her husband. …didn’t she follow the right recipe? If that’s the way we think of Anna then we have fallen into a deadly trap: the trap of finding our security in something other than Christ. It’s so easy to turn godly goals into idols without even realizing it. We put our kids in the right programs, we volunteer for the right ministries, and we check off our “good wife” duties. Suddenly these become gods that should protect us. If we have all of our ducks in a row our kids will turn out okay. Our husbands will be faithful to us. We will fly under the radar and avoid scandal and heartbreak and broken families. As Christian wives we all fall prey to this false sense of security. If you’re like me you cringed when you saw the rug pulled out from under Anna because you didn’t think she deserved it. But in reality what happened to Anna was caused by sin. We can never build walls high enough to keep sin out because sin ultimately comes from within. The only deliverance we have from sin is Christ. In Him every sin is forgiven and we are treated as blameless. While still vulnerable to the pain of sin in this life, our heavenly reward remains untouched. Tonight I tucked in four sweet, robust little boys. My husband bought me my favorite candle and asked me about my day. I am unbelievably blessed. But there is a difference between thankfulness and idolatry and I don’t want to cross that line. I do cross it all the time. I know because instead of soaking up the joy of my blessings I’m often anxiously thinking of all the things that could go wrong. I want to hold on tightly to these gifts He’s given me and never let go. What happened to Anna – and what happens to many women – reminds us to hold everything in this world loosely. Nothing in this life offers us true security. Not our husbands, not our children, not our church affiliations, not our dress codes. That might sound terrifying, but it’s actually the most comforting news we could ever hear. Ask a mom who has lost a child. Ask a wife who has lost a husband. What is under your feet right now, moms? Is it the shifting sand of dependency on people and your own good choices? Or is it Christ, the Everlasting Rock? He is strong enough for Anna and He is strong enough for us. Looking for a Bible study that offers practical theology for busy moms? 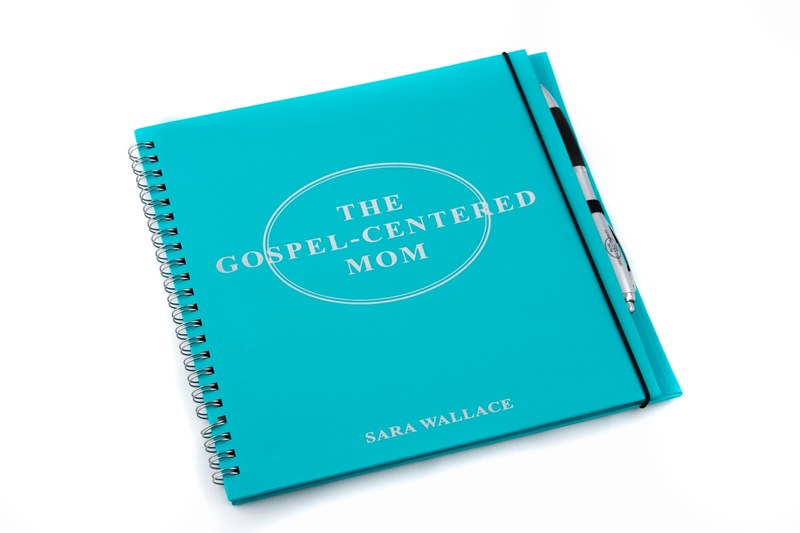 Check out “The Gospel-Centered Mom,” available on Etsy and Amazon. Amen and Amen. Thank you. Great insights on a tragic situation. There is always redemption and hope in Christ. Thank you for speaking truth and always pointing us to Christ. Not really sure that Anna is needing to be discussed publicly by every Christian blogger mom. I feel like she and her situation are being used, albeit with the best of intentions. Christian moms have been terribly shaken by this situation, some more than others. The point is not to gawk at Anna's pain, but to use the sufferings of God's people to encourage each other with the hope of the gospel. Maybe you should ask her if she wants to be used as an example first. She is going through hell, and I frankly don't think she needs the scrutiny that comes with being the topic of discussion, whether well- or ill- intended. I bet what she'd really like is to NOT be discussed. “Ask Anna.” Right now? Could you just give her a few weeks before turning her into a sermon illustration? Sometimes it's comforting to know that at least our greatest tragedies have helped encourage others to better love and serve their God. Sometimes that's the only comfort we have. This “comfort” could have just as easily been given without ever mentioning Anna's name. I'm not meaning to be hurtful to you, Sara, just honest — but I have to admit my doubt that you suddenly learned these things specifically from Anna Duggar as your title claims. Secondly, if this was happening to your own sister, would you be so eager to blog about her while she was so damaged with such a fresh, raw wound? Why wouldn't you give your sister in Christ the same respect? I hope that you are honestly considering your motives in this, and that you aren't using Anna's name for click-bait. Lovely article. 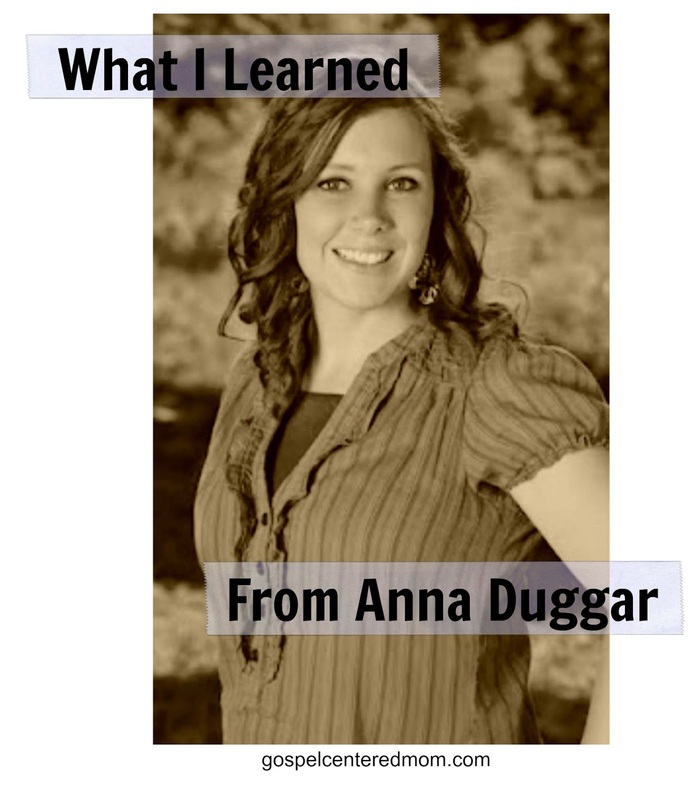 Respectfully, to those who are questioning the use of Anna's name – the Duggars chose to put themselves in the spotlight long ago, not this blogger. Enter the age of the internet and news that travels quickly, all over the world. The “issue” is all over the internet; difficult to miss if you are even browsing for a recipe. To NOT address this, using the D name or not, would be ignoring the elephant in the room. To question someone's judgment or motives when they did address it (whether they used the name or not – it's not a secret) is presumptuous and unkind. This issue is going away for the moment and addressing it in a thoughtful way is not wrong. By the way, I don't know gospelcenteredmom. Anna & her situation was already very public. She chose to have her life played out in front of everyone, when she decided to marry Josh. She knew her family would be in the spotlight, and willingly chose that life. However, she did not expect her husband to cheat on her. Unfortunately, the good and the bad is out there for all to see. We can learn from this heart wrenching situation Anna is living. Even when you think life is going wonderfully, the rug can be pulled right out from under your feet for you to fall. Satan is having a big laugh at Josh's fall, and trying his best to completely destroy all of his family. I will continue to pray & support Anna and the rest of the family during this trying time. Sara, thank you for the reminder to always keep our focus on Jesus! I whole heartedly agree with this! My heart breaks for Anna, I've been in her shoes…and I've been in Josh's shoes… I wanna share my blog with you that I wrote about it. I don't want to seem like I'm trying to promote my blog on your page, so feel free to not allow this post. I just wanted to share with you the other side of the coin, so to speak. What beautiful, encouraging and truthful words. I think Anna would be glad to see this wisdom filled article being written in an unfortunate situation to help the many others that have faced or will face similar situations. God waste no suffering, and Anna will realize this in time. You nailed it Sara in this article. As a wife who thought something like this could never happen, you nailed the struggles one faces when something like this is exposed. While it tremendously hurts, it truly exposes your own sin and idols in a big way and that I can be thankful for! How refreshing for someone to take the perspective you did instead of bashing and ridiculing him! What an encouragement you have been to me personally and many others I am certain. I disagree that she's being “used.” Her life was already public by her choice — she would have had to sign release forms to be part of the program, so she knew what she was getting into. While it doesn't make her “fair game” for stalking, what has been made public (either by her choices with the show or by the media in this go-around) is fair for discussion. As for the situation, it's not unlike when close friends – who seem to have it all together – divorce, and you think, “WHOA! How could it happen to *them*? They're the perfect couple because…” I think a lot of people are feeling that same, “If it happened to them, then none of us is 'safe'!” I don't think it's fair to blame Anna for her husband's choices (and she shouldn't blame herself, but that will hopefully come with time and perspective), but it should make each of us stop and consider, “What can I do differently to be a better person/wife?” It still doesn't mean we are responsible for bad choices our spouses make, but should remind us that we may need to get ourselves off of autopilot in general. We don't know the entire “behind closed doors” story, and it's not our business. All of that is between them. However, we'd be fools not to use what we do know as a learning experience for all of us. Perhaps if she hadn't dressed so “modestly” or been raised to be such a prude, her husband wouldn't have had to look elsewhere. Sorry I just think she's not the only Christian wife who has gone through this. She is the VICTIM! If he wanted something other than a modest young woman, he could have married someone else. It is in no way her fault. He chose to cheat. Don't make her out to be responsible for his actions. I am pretty sure “noone” is just that. No-one. Don't feed the troll.. this person is obviously foolish and trying to get a rise of anger with their idiotic comments. Sounds a lot like a child wrote it. I agree with this article 100%. I homeschooled all 5 of my children for over 20 years. To my great sorrow, I've seen many of these families suffer through divorce, infidelity and children who turn their backs on all the things their parents believed. We do need to remember that we and our children are not “safe” just because we home-school, go to church, are stay-at-home moms, wear modest clothing, don't listen to popular music or watch television. These things happen because we are sinners and the Enemy is waiting for any opportunity to attack us where we are weakest and destroy our families and our Christian witness. We must remember to pray for God's protection for our husbands, our children and ourselves. Please don't think that this or some other terrible thing can't happen to your family. I've known too many moms who did everything “right” and still ended up divorced or with prodigal children. Anna, my heart goes out to you. Many don't take our wedding vows to heart and I know that you do. After ten years my husband left me and our little girl. We did work it out and just before he passed away we celebrated our 53rd. anniversary. Stay faithful and trust God and I believe that God will work it out. The Bible tells us that HE WORKS OUT ALL THIINGS FOR OUR GOOD. Love you.